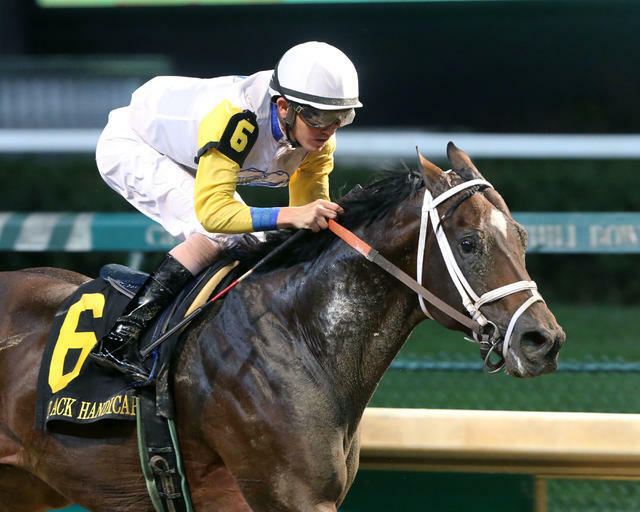 Charles Fipke’s homebred Seeking the Soul, the 2017 Clark Handicap presented by Norton Healthcare (Grade I) winner, has his sights set on a repeat performance in the 1 1/8-mile race on Friday, Nov. 23 following his runner-up effort last Saturday in the $1 million Breeders’ Cup Dirt Mile (GI) at Churchill Downs. Seeking the Soul, a 5-year-old son of Fipke’s stallion Perfect Soul (IRE), was pointed to the Breeders’ Cup Classic but was No. 17 on the preference list with only 14 horses making the starting gate. A six-time winner, Seeking the Soul has only finished off the board twice beneath the Twin Spires with a 9-3-2-2 record. Other possible contenders for the Clark Handicap include Bravazo, Hawaakom and Leofric. Nominations to the $500,000 race close Saturday. To nominate, visit: https://www.churchilldowns.com/horsemen/stakes/nomination-forms/. Race 2 Thursday features the third-career start for Michael Ryan’s Positive Spirit, who is the 2-year-old half-sister to 2007 Spinaway Stakes (GI) winner Hot Dixie Chick. The one-mile maiden special weight contest has a post time of 1:30 p.m.
Race 7 Friday features Whisper Hill Farm’s $700,000 purchase Tapit Wise, who is the half-brother to 2010 Alcibiades Stakes winner Wickedly Perfect. The 2-year-old maiden special weight contest has a post time of 4:06 p.m.
Saturday’s 11-race program will feature the $100,000 Commonwealth Turf (GIII) for 3-year-olds run at 1 1/16 miles on the turf. Track Superintendent Jamie Richardson reported that he expects to have turf works on Sunday and Tuesday barring inclement weather. The Matt Winn Turf Course was labeled “good” for racing on Wednesday and the rail will be placed in Lane 3, 22 feet off the hedge. There will be a Veterans Day celebration Sunday at Churchill Downs where active and retired military members are invited to enjoy a day at the races with free general admission or a discounted $29 ticket price for Millionaires Row. To purchase tickets, contact groupsales@kyderby.com or call 502-636-4450. Join Churchill Downs Racetrack’s Darren Rogers and Kevin Kerstein for “Inside Churchill Downs” Friday at 6 p.m. on ESPN 680/105.7. The one-hour show features prominent trainers, jockeys and handicappers. To listen live, visit www.espnlouisville.com. Churchill Downs Today will air every race day at noon on TwinSpires.com and across simulcast outlets. Join Churchill Downs Racing Analyst Joe Kristufek along with TwinSpires.com’s Ed DeRosa, James Scully, Scott Shapiro and Brandon Stauble as they handicap the day’s races. There was a $38,367 carryover in the Single 6 Jackpot and $21,311 carryover in the Super Hi-5 on Wednesday’s program. Churchill Downs all-time leading trainer Dale Romans is on the cusp of 2,000 career wins. The South Louisville native began the week with 1,994 wins and has seven entries Wednesday-Friday. MEET LEADERS – Jockey Brian Hernandez Jr. held a 6-5 win lead over Florent Geroux and Joel Rosario in the jockey standings to begin the racing week. There was a four-way tie for fourth between Tyler Gaffalione, Julien Leparoux, Jose Ortiz and Ricardo Santana Jr. with four wins. … Six trainers sat atop the trainer standings with three wins: Steve Asmussen, Bob Baffert, Mike Maker, Kenny McPeek, Bill Mott and Anthony Quartarolo. … Loooch Racing had a 4-3 win lead in the owner standings over Juddmonte Farms. BRISNET.COM’S CHURCHILL DOWNS AT A GLANCE – To revisit stats and information from the opening week of the Fall Meet at Churchill Downs, visit: http://www.brisnet.com/content/2018/11/churchill-downs-glance-november-5/.